↑ E. Y. Choueiri. "A Critical History of Electric Propulsion: The First 50 Years (1906–1956)". http://alfven.princeton.edu/papers/choueiriJPP04a.pdf. pristupljeno 7. studenog 2007..
↑ 2,0 2,1 "Innovative Engines - Glenn Ion Propulsion Research Tames the Challenges of 21st Century Space Travel". http://www.nasa.gov/centers/glenn/about/fs08grc.html. pristupljeno 19. studenog 2007..
↑ "ESA and ANU make space propulsion breakthrough" (Press release). ESA. 2006-01-11. Pristupljeno 2007-04-29. 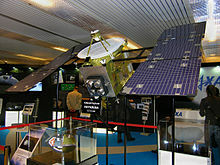 ↑ ANU Space Plasma, Power & Propulsion Group (SP3) (2006-12-06). "ANU and ESA make space propulsion breakthrough". DS4G Web Story. The Australian National University. Arhivirano iz originala 27. lipnja 2007.. http://web.archive.org/web/20070627103001/http://prl.anu.edu.au/SP3/research/SAFEandDS4G/webstory. pristupljeno 30. lipnja 2007..
↑ 6,0 6,1 Oleson, S. R., & Sankovic, J. M.. "Advanced Hall Electric Propulsion for Future In-Space Transportation". http://gltrs.grc.nasa.gov/reports/2001/TM-2001-210676.pdf. pristupljeno 21. studenog 2007..
↑ Marcuccio, S.. "The FEEP Principle". http://www.centrospazio.cpr.it/FEEPPrinciple.html. pristupljeno 21. studenog 2007..
↑ Colleen Marrese-Reading, Jay Polk, Juergen Mueller, Al Owens. "In-FEEP Thruster Ion Beam Neutralization with Thermionic and Field Emission Cathodes". http://trs-new.jpl.nasa.gov/dspace/bitstream/2014/11649/1/02-0194.pdf. pristupljeno 21. studenog 2007..
↑ Pavlos G. Mikellides. "Pulsed Inductive Thruster (PIT): Modeling and Validation Using the MACH2 Code". http://gltrs.grc.nasa.gov/reports/2003/CR-2003-212714.pdf. pristupljeno 21. studenog 2007..
↑ 10,0 10,1 K. Sankaran, L. Cassady, A.D. Kodys and E.Y. Choueiri. "A Survey of Propulsion Options for Cargo and Piloted Missions to Mars". http://alfven.princeton.edu/papers/Astrodyn-Finalabstext.htm. pristupljeno 21. studenog 2007..
↑ Michael R. LaPointe and Pavlos G. Mikellides. 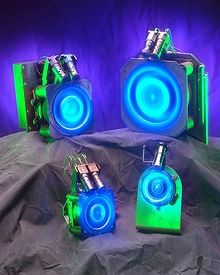 "High Power MPD Thruster Development at the NASA Glenn Research Center". http://gltrs.grc.nasa.gov/reports/2001/CR-2001-211114.pdf. pristupljeno 21. studenog 2007..
↑ Buford Ray Conley. "Utilization of Ambient Gas as a Propellant for Low Earth Orbit Electric Propulsion". http://dspace.mit.edu/bitstream/handle/1721.1/31061/33887503.pdf?sequence=1. pristupljeno 1. svibnja 1995..
↑ Gregory D. Emsellem. 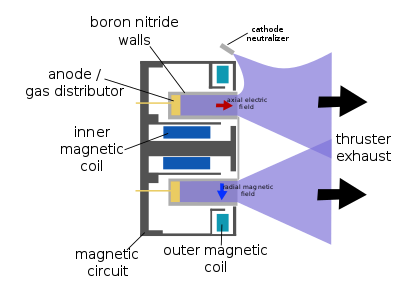 "Development of a High Power Electrodeless Thruster". http://www.elwingcorp.com/files/IEPC05-article.pdf. pristupljeno 21. studenog 2007..
↑ "Destructive Physical Analysis of Hollow Cathodes from the Deep Space 1 Flight Spare Ion Engine 30,000 Hr Life Test". http://trs-new.jpl.nasa.gov/dspace/bitstream/2014/39521/1/05-2793.pdf. pristupljeno 21. studenog 2007..
↑ ESA. "Artemis team receives award for space rescue". http://www.esa.int/esaTE/SEM1LT0P4HD_index_0.html. pristupljeno 16. studenog 2006..
↑ ISAS. "小惑星探査機はやぶさ搭載イオンエンジン (Ion Engines used on Asteroid Probe Hayabusa)" (Japanese). http://www.ep.isas.ac.jp/muses-c/. pristupljeno 13. listopada 2006..
Ova stranica je zadnji put izmijenjena 19:16, 28 maj 2015.